Alicia Mora-Hyde was born on a farm in Chile. Suffering a number of hardships Alicia ran away from home at 17 and worked in a clothes store, but still managed to finish her education at night. Alicia always had the dream of travelling and one day opening her own shop, America seemed to be the place to go but eventually the Australian offer of a free ticket was too good to pass up. Alicia arrived in Australia, barely able to speak english and was only able to get manual work in a chocolate factory, which only lasted a short while. Next came a job as a nanny to two young boys whose father was a Sydney business man, the owner of a very successful umbrella factory employing 30 people. Even after the boys grew up Alicia stayed with the family for 30 years during which time she began working in the umbrella factory, eventually becoming floor manager. 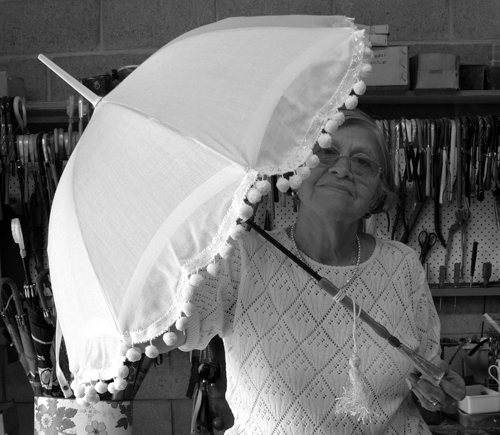 Over time, Alicia learnt every facet of the umbrella trade and believes she is the only woman in the world that can make an umbrella from start to finish. After the death of the owner, his son's showed no interest in maintaining the business and Alicia managed to take the business over determined to carry on the tradition of making fine umbrellas. Huge rents and expenses in Sydney convinced Alicia to make her move to Brisbane in 2002. Married soon after moving to there, Alicia found a warehouse in Brendale and set up her factory from where she now solely creates her fine hand-crafted umbrellas. Buying fabrics locally and also from Chile Alicia does it all by herself turning the humble umbrella into a unique fashion accessory that can't be matched world-wide. Alicia only sells from her Brendale factory, because of her only making unique items and not producing a 'line', the large department stores don't want her. Still, Alicia Mora-Hyde will continue what she loves - making umbrellas.